Trofie pasta is a Ligurian specialty and this is one dish that you’ll find on most restaurant menus. 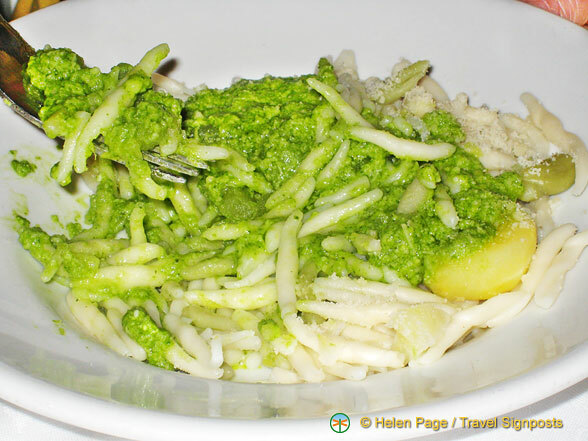 Trofie is often served with pesto (Trofie al Pesto) which is also a specialty of the Ligurian region. In fact, Liguria is the birthplace of pesto which uses basil as its main ingredient. Basil grows very well in the temperate Ligurian climate. The Trofie pasta is made with flour and water and the dough is rolled on a flat surface until it forms a thin rounded strip of pasta with tapered ends. It is then cut into little pieces and twisted into its final shape. You can buy the dried version, which look like thin, pale “Twisties”. They plump up to 2-3 times their size when cooked. Trofie al Pesto is a quick and simple enough pesto pasta dish to prepare if you buy the pesto sauce and of course its flavour relies heavily on the quality of the pesto. Freshly made pesto is always preferable as you can’t beat the smell of freshly grounded basil. Grounded basil also oxidizes quickly turning into a dark shade, so it’s the freshly made pesto that gives the fresh green colour that you see in this photo. We found the pesto quality varied quite a bit in Cinque Terre with some restaurants using diluted pesto sauce resulting in a tasteless Trofie al Pesto. However, when you come across a good version, its delicious. Heat some water in a large saucepan with a tablespoon of salt and bring it up to a boil. Add the pasta, stir and let it cook for 10 minutes. Drain the pasta in a colander, then tip it back into the saucepan. Add the pesto sauce (and vegetable) and stir it to give everything a good coating. Serve in heated pasta bowls and sprinkle with parmesan. Cooking time is 15-20 minutes.